RMJ Tactical has almost become synonymous with the term tactical tomahawk. 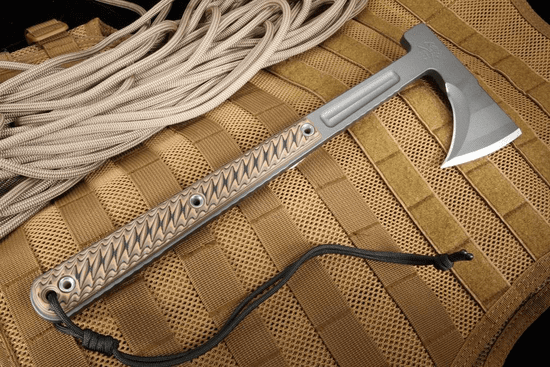 Providing Special Forces with this reliable battlefield implement for nearly twenty years has given RMJ a worldwide reputation as being the go-to company when it comes to combat ready tactical tomahawks. The Kestrel Trail is no exception. 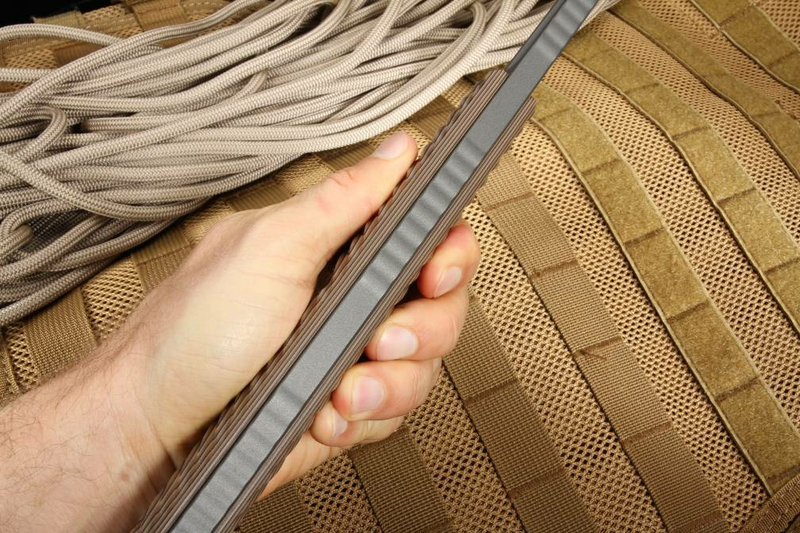 It's predecessor and big brother, the Eagle Talon has been used in combat operations for years, not only as a tactical weapon, but also as an entrenching tool, survival implement, and an everyday carry blade for some of the most seasoned soldiers on the planet. If it can be dared to say, the Kestrel trail is an improvement on a nearly perfect design. The "Trail" gives the user the added advantage of replacing the backspike with a hammer. Because sometimes in a world of nails, tent spikes, rocks, and other stuff, what you really need to get the job done is a hammer. The Kestrel Trail is 13" overall, from the knob of the handle to the top of the head. The steel is 3/8" super-tough 80CrV2 tool steel stock (Rockwell hardness of 56), which is forged tough as well as ready to take an edge and keep it, regardless of the punishment you put it through. The beard of the axe is 3" of razor sharp cutting strength and from the forward edge to the hammer, you've got 4.4" of steel to give you power and momentum with every swing. The finish is a black matte Tungsten cerakote finish, which provides corrosion resistance in all kinds of weather and environments, as well as added hardness, protecting it from scrapes and dings you will pick up with heavy use. The full tang, I-beam design of the handle is incorporated with a G-10 3D machined handle, which reduces weight without sacrificing toughness or a sure grip. Colors are available in Black, Hyena brown, and Dirty olive through a process of layering the G-10 composite. 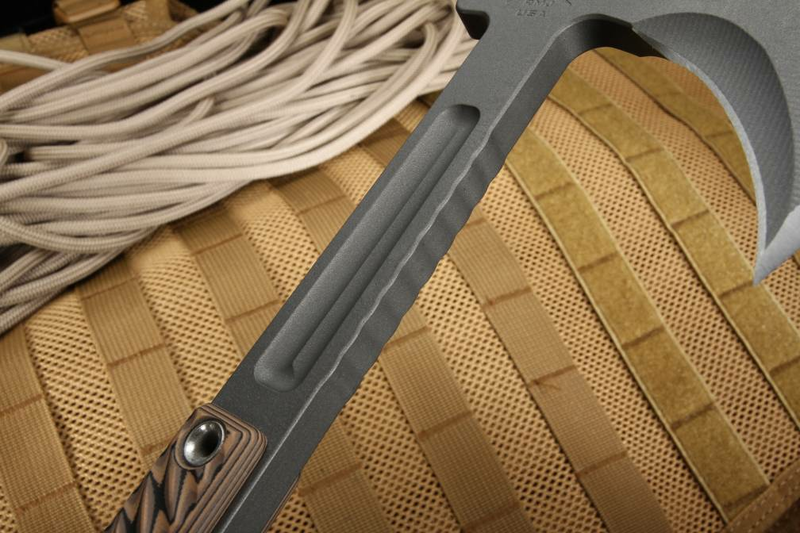 At 24oz, you will know you are carrying this tomahawk, but the bottom eject Kydex scabbard with Low Ride MOC straps will keep your Kestrel Trail secured and ready when you need it. 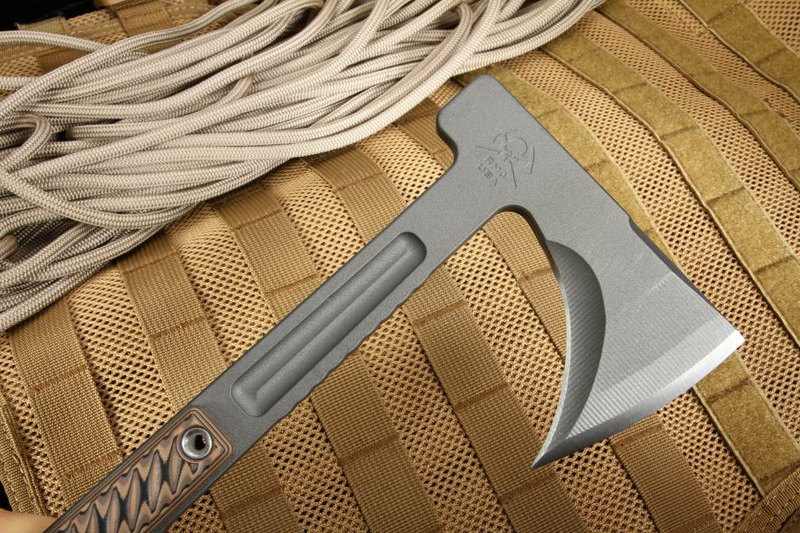 Made in the USA, RMJ offers a lifetime guarantee against structural failure and craftsmanship (excluding wear and tear) not only for the lifetime of the user, but the tomahawk itself! 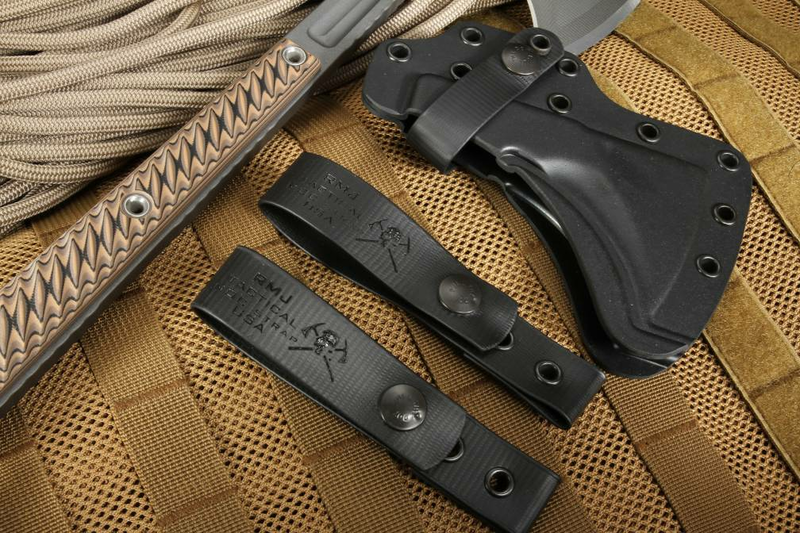 Proud to be an authorized dealer for RMJ Tactical, Knifeart.com offers fast, free shipping and a satisfaction guarantee for our blades. If you don't like your purchase, simply return the blade and we never charge a restocking fee.